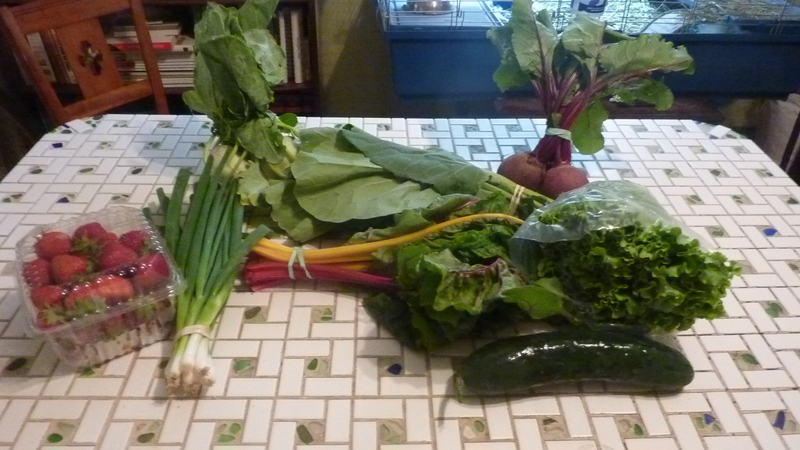 In this week’s share, we received (from left to right) – strawberries, scallions, kohlrabi, collard greens, Swiss chard, beets, lettuce, and a cucumber. With last week’s share, Zak made a lovely Nicoise Salad, which used lots of lettuce and an onion from the CSA. I made garlic sauteed Swiss chard with creamy goat cheese polenta that used all of the Swiss chard. I will be posting both recipes in the next couple of days. We still had some lettuce left over, as well as the kale and an onion. Everything else got used up. My super-awesome sister in law is in town, so we’re headed over to my in-laws for dinner tonight and Zak is chopping up a big salad that features a lot of CSA ingredients. I’m most excited this week for all of the greens – I’m looking forward to making a big mess of sauteed chard, beet tops, kale (from last week), and collard greens, probably with some lemon juice and garlic. I plan to mix some of it with quinoa and make a healthy wrap for lunches.